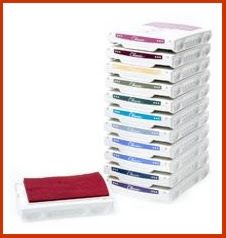 Craftin' Caro: Would you like a full Family pack of Classic Ink Pads? Would you like a full Family pack of Classic Ink Pads? Who wouldn't?! Getting 12 free ink pads to supplement the demonstrator Starter Kit is a great deal, and it's here only until Sept 30. New recruits may choose between our four colour families (Bold Brights, Earth Elements, Rich Regals, and Soft Subtles - 12 pads each) or choose a 6-pack of our 2007 In Color pads. * What's included in the Starter Kit? * Request a Free Information package to be mailed out (sorry, Canada only).